Sunday tends to be a major lazy day for me and my husband. However, my 22 month old son doesn't understand yet how Sunday's work; you sleep late, eat late, feel anxious about everything (especially that the next day will be Monday). I'm trying to banish this horrible Sunday feeling by waking up early, getting things done, and planning fun trips for the three of us in advance so there's no moseying around for hours trying to figure out what to do. Yesterday was a really special Sunday. We had breakfast together, spent the day at the Prospect Park Zoo- which I highly recommend- it was enjoyable for ALL three of us- unlike many kiddy places which end up being miserable for me and fun for my son. Anyway, instead of eating weekend leftovers I baked spaghetti squash and quickly made light and fluffy meatballs and sauce (no breadcrumbs). 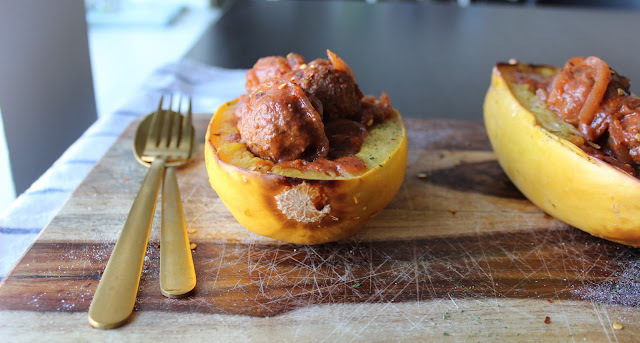 It was a quick and easy dinner, and I recommend buying small or organic spaghetti squash so they won't have to bake as long- and they are so cute and completely personal sized. You can also make my sweet and sour meatballs which are also on the blog- the sauce is so good with the spaghetti squash! 1. Preheat oven to 425°. Line a baking sheet with parchment paper. place squash on its halved side (flesh down). Bake for 45 minutes- 1 hour. In a large pot over a medium-high flame add the oil and onions with kosher salt and coarse black pepper. Cover pot and let oils sauté until translucent and lightly beginning to brown. In a medium bowl mix beef, spices, egg and water until completely combine (meat should feel semi fluffy). 2. Once onions are golden add marinara sauce, roasted tomatoes (in juice), vegetable broth, and red wine. Stir well and cover pot until sauce begins to boil. Reduce flame to medium low. 3. Wet hands and form 1" round meatballs (wet hands in-between forming balls to keep from sticking). gently place meatballs into sauce. Do not stir meatballs after placing into pot until cooked through. Cover with lid and bring flame to medium high. Let meatballs cook for 10-15 minutes. Gently stir pot, and bring flame to a low and continue to cook for 15-20 minutes. 4. sprinkle Spaghetti squash halves with chili flakes, kosher salt, and black peppers. Fill the centers with meatballs and plenty of sauce.